The nitrile is formed by emulsion polymerization of butadiene and acrylonitrile. In order to improve the bonding strength and mechanical properties of wet gel and vulcanized rubber, nitrile latex often been added carboxyl-included monomers in the copolymer modification. The common carboxylic monomers are acrylic acid, methyl acrylic acid, etc.. Carboxyl nitrile latex can significantly improve the mechanical stability, latex oil resistance and aging resistance. Hand mould cleaning→Hand mould oven→coagulate tank→oven→Latex dipping tank1→Oven→Latex dipping tank 2→Oven→water washing→Oven→Beading→Main oven→Cooling→Chlorine wash tank→water washing→neutralization→PU tank→Final oven→Pre-stripping→stripping→QC→Packing→Storing→Pre-selling check→Sold. Nitrile gloves are acid and alkali resistance, oil resistance, non-toxic, harmless and tasteless. It is made of nitrile synthetic material without the protein contains in the latex which can easily make human allergic. It has a lot of advantages like the following: selecting formula and advanced technology, soft and comfortable non slip, flexible operation. Nitrile gloves does not contain phthalates, gloves, silicone oil, amino compounds and have good performance, clean and anti-static properties, aging resistance and oil resistance. Purificated NBR gloves shape can be designed according to the human hand, with great sensitivity, excellent tensile properties and puncture resistance, high tensile strength and excellent abrasion resistance. Nitrile gloves are soft, comfortable and well fit. It has features such as durability and safety. Blue pigment was added into raw materials, no finish product release, do not fade, no effect on the product. Using 100% synthetic nitrile rubber produced, low ion content. Direct exposure to the sunlight or ultraviolet rays is prohibited. Storage should be stored in a cool and dry storage (indoor temperature 30 degrees below, relative humidity below 80% is appropriate) 200mm from the ground on the shelf. 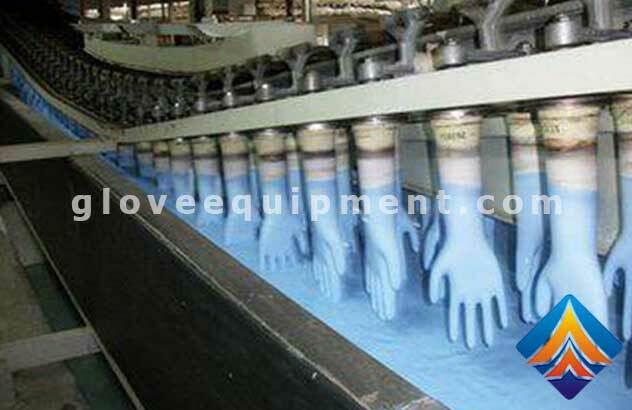 The Nitrile Gloves making machine device is based on the chemical properties of raw materials and glove molding process design requirements, process compact, well-structured.